Around 1,000 small business owners have filed a petition seeking reversal of NYC’s polystyrene foam ban, according to New York Restaurant Action Alliance (RAA). 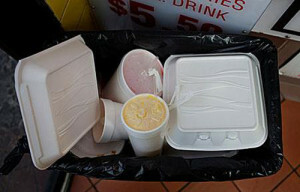 ALBANY (Scrap Monster): According to New York Restaurant Action Alliance (RAA), around 1,000 small business owners from across five boroughs have signed a petition seeking reversal of the city’s ban on Polystyrene (PS) foodservice products. It must be noted that two NY senators- Betty Little and John J. Bonacic had urged Mayor Bill de Blasio to reverse the ban, which has come into effect from July 1st onwards. The businesses are granted transition period of 6 months, after which fines will be imposed on violators. RAA believes that the ban will badly hit small businesses as it prohibits food service establishments from possessing, selling or offering single-use foam materials such as cups, plates, trays and clamshell containers. The law also bans sale and use of PS loose fill packaging. The Association alleged that the city’s decision to ban polystyrene foam was not based on facts. It is being proved that foam is 100% recyclable. Other cities including Los Angeles and a large numger of Californian cities have foam recycling programs. RAA highlighted the need to support polystyrene foam recycling. Such recycling activities could generate revenues and create jobs. In addition, it will also lead to reduction of landfill costs, RAA noted. The lawsuit challenges the legality of the decision to ban PS foam products and has been submitted for deliberations. Arguments are expected to begin next week. A final decision is expected before Jan 1st, 2016, when the ban officially goes into effect.